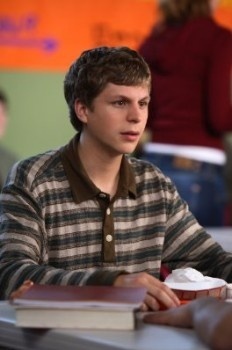 Superbad star Michael Cera is at work on a new project, but despite his recent run of cinematic success, nobody seems to know what it is. Called Paper Hearts, the movie will star Cera and other talent from the "Judd Apatow stable" in a comedy about his real-life relationship with Charlyne Yi, an actress familiar to Apatow fans as Jodi, the pigtailed stoner in Knocked Up. The film may not be widely known to average movie-goers yet, but The Hollywood Reporter says that's at least in part because seller UTA has intentionally kept the film quiet in hopes of making a big splash when it debuts. One industry veteran added that too much advance publicity can easily work against a film, saying, "Any movie that's going to be touted too much will have a bull's-eye on its back." But Paper Hearts is generating considerable buzz on the indie circuit, with one observer noting, "It's pretty much 'the one,' at least as far as festival programmers are concerned." The movie, described as a part-documentary, part-scripted comedy, is expected to premiere at the 2009 Sundance Film Festival in January. But don't bother looking for it on IMDB; when they say this project is a secret, they're not kidding.